Fears of worldwide slowdown, plunging oil prices, and a troubled junk bond market have all caused increased selling pressure in the markets. Additionally, fading confidence in global central banks' ability to step in and prop up markets has also been a contributing factor. The Dow, S&P 500, and the Nasdaq are down 7.66%, 7.15%, and 9.02%, respectively, just three weeks into 2016. According to Lewitt, it's easy to see how this market turmoil developed in the first place. 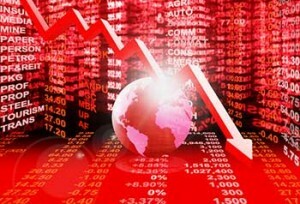 And even though the markets have bounced back in the last two days, Lewitt says we likely haven't seen the bottom yet. Is a 2016 Stock Market Crash Coming? According to Lewitt, China is the biggest factor that will pull down the S&P 500 if we see a 2016 stock market crash. "China is in serious trouble with little sign that conditions will improve anytime soon," Lewitt said. "The question is whether China and its commodities bubble will take down the world like the United States and its housing bubble did in 2008. Nobody can answer that question with certainty, but we do know that there is more debt and more geopolitical instability today." "On the flip side, U.S. banks are much better capitalized and in a much better position to handle a global sell-off," he continued. "For the moment, the most likely scenario is that markets continue to sell off but that we experience something less severe than 2008. But that could still mean large losses for investors." Lewitt has lowered his 2016 S&P 500 forecast to 1,650 to 1,750. That's down from his initial prediction of 1,875 to 1,900.